I recently was driving through the bottom of the hand of Michigan on Route 12 when I stumbled into the town of Allen. It’s billed as Michigan’s antique capital. Maybe yes, maybe no — I don’t know. But as my wife delved into the vintage clothing and cookware, I began wandering the aisles of the Allen Antique Barn and that’s where I found a boatload of Beatles bootlegs in a stall adorned with an untold number of Kiss t-shirts. If you’ve ever looked through the record bins of an antique store, one thing becomes abundantly clear — no one wants old LPs. Don’t kid yourself — you can get almost anything for $20, even an excellent copy of Sgt. Pepper’s. But I was immediately taken aback by the record bins in this Kiss-themed booth. Here, I found at least a dozen Beatles’ bootlegs. Now I’m sure some of you collectors are yawning right about now but I’m directing this at the average fan, like me for instance. I have not seen a Beatles bootleg in the flesh since the mid-1970s when a friend had a copy of Kum Back. And now here in this nowheres-ville antiques mall were a dozen of said bootlegs. The first one I found was the one I bought. 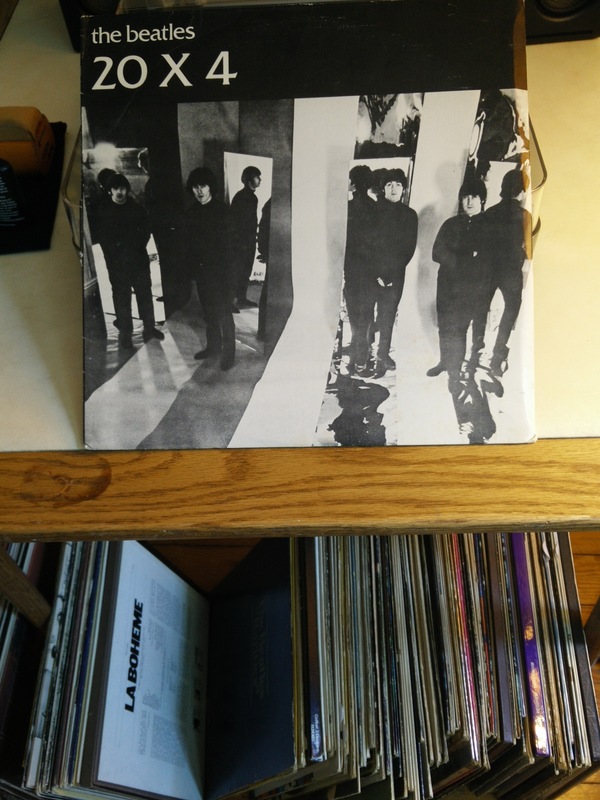 It’s in the photo above: The Beatles’ 20 x 4. Not only had I never seen some of these versions of songs, I’d never seen the album cover photo….and I’ve seen a lot of Beatles’ photos. It was $50 but since everything in the booth was half-price, it was truly only $25. I was drawn to this one because it contains the McCarney-Donovan version of “Blackbird” and the quality is good despite what some reviews say. I agonized over the other LP’s but ultimately only bought this one. I’ve tried to get in touch with the owner of the booth since so I could provide more information to you dear reader but the folks at the Allen Antiques Mall were decidedly unhelpful on the phone. But I’m betting those Beatles bootlegs are still there and I want you true fans to go and get ’em. They’re in booth #37 of the Allen Antique Barn. Let me know how you make out. Best of luck!! Donovan Day’s novel about a millennial’s account of meeting The Beatles through a time-traveling iPod will be released this fall….in time for John Lennon’s 75th birthday celebration.